For the latest episode of their “Inside The Studio” podcast, host Joe Levy and the iHeartMedia team made a very special trip to meet with Paul McCartney in Winnipeg surrounding a show on his current tour in support of his chart-topping Egypt Station album. Paul McCartney telling stories about John Lennon, George Harrison and Ringo Starr, sharing secrets from the Beatles in the studio, on living a normal life while being one of the most famous people in the world and more is every bit the magic you would expect. 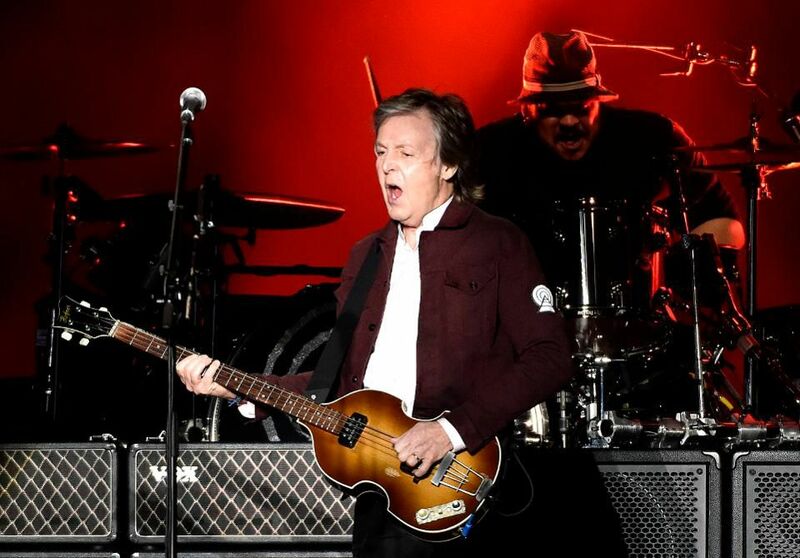 This is Paul McCartney on “Get Back,” on “Penny Lane,” on Sgt. Peppers, on “Blackbird.” Just enjoy. 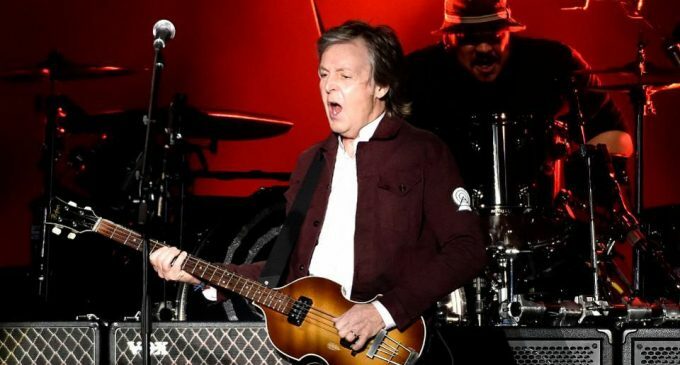 Paul McCartney: I think everyone, like me, who believes in climate change, and that’s a lot of people, we’re looking at these climate accords and these meetings, there was one in Japan, there was one in Copenhagen, and as these came up we’d all be looking at it and going, “Oh, this will be the one. We’re going to do something about it. Everyone’s going to get together, all the nations are going to agree that we’ve got to figure it out.” And then it would fail. “Ah, I don’t believe it. America and China didn’t sign it.” And it was so disappointing that finally when Paris arrived, it was like, “Yay, I can’t believe it.” And then Trump pulls out of it, it’s like, “Ooooo … ” see now, that was like really disappointing. But the thing is, as far as I’m concerned, it’s a reality. I don’t think there’s any doubt about that. We’re getting this freak weather. And you could say, as some people who deny climate change say, “Well, you know, there’s always been freak weather.” But I believe scientists. They study a bit harder than I do. The science does indicate that if you warm up the planet, you’re going to get these effects. I walk down streets. They’re for walking down. I like to get out and about and people say, “Oh no, you’ve got to have acres of security behind you and stuff,” but I like to just get out, just so as you feel like yourself, instead of like a rock star. So I like to just get out like I always did when I was a kid. It keeps me sane. And it’s the same feeling as when I was a kid, just walking around. The only difference is I get recognized. Everyone reaches in their pocket immediately for their phones. But, I’ve got quite a lot of freedom, actually, and I value it. The Beatles, even when we were like maybe 20, 24 years old or something, at the height of The Beatles, we often would try to work out something on a song or what we were gonna do with a recording, we’d often say, “What would we have done when we were 17?” And we’d check back to our 17-year-old selves, who we thought were the coolest opinion in the world. You’ll always refer to that period. It’s your formative period, it’s when you get a lot of your ideas, and in my case if you’re writing songs, those memories are very rich wells of inspiration. So I can just think, “I remember walking along the road with our guitars on our backs, me and John, just before we were famous.” Writing letters to people, “Dear Sir, we are a rock combo and we would love to play at your place.” All that sort of stuff. It’s kind of like magic for me. I think also because of how far I’ve come, so you got that very early innocent period and then we get famous with The Beatles, but before that we go to Hamburg, as you say, and then we get famous with The Beatles, and then we get the American fame and then we make records and we go through our various phases, so it’s a long, long, long journey and then right now, here I am, making a new album, Egypt Station, and lo and behold, it goes to number one in America. You can imagine we’re partying. That night was a party. We did the Cavern. We went back to my old school and did a little concert there. It made it fun. It made it interesting and each little thing was different, and so it was great. Yeah, Cavern were happy and I was happy with the ideas we were cooking up together. As long as they were good ideas that were exciting everyone, we had a blast. When I was working with Greg, which was most of the time, I had a lot of songs I wanted to record. So I came in and we worked on them together, but they were ready written. Then there was a period there where Greg couldn’t work, but I had a couple weeks off so I took one of the weeks as a holiday and then the other week, my manager said, “Do you want to keep the momentum going? You’re on a bit of a roll here, and if you want to keep it going, I can suggest other people you might work with.” So he sent me a few suggestions. I liked what I was hearing that Ryan was doing. I didn’t know much about him. I phoned him up and we had a great conversation, so I said, “Well, come to my studio in England and we’ll just figure it out. We’ll just think of something.” So I said, “I’ve got a couple of songs. We could do these.” He said, “No, no. Let’s just make it up.” We didn’t have long. We just had the seven days, it might have even been five days. So we just made them up and we ended up making up three tracks. I wasn’t really gonna watch this ‘cuz, it’s like I thought, “Well, I kinda know everything he’s gonna tell me.” Then he started in on “Penny Lane.” It hooked me in ‘cuz he started to say, “Oh, now Paul wants to go higher, but he actually modulates down a key.” I’m going, “Did I? Oh, wow. That’s good.” I’m getting impressed by this young 24-year-old’s work, you know. Now I’m intrigued, and he got to this bit where he sort of said, “And the `Penny Lane’ piano.” I thought, “Yeah, okay, I know. I played it. I know how that went.” He said, “It’s not just one piano.” I’m sitting there going, “Yeah, it is. What do you mean, it’s not just one?” He starts going back to the multitracks, and he goes, “Well, there’s one piano.” I said, “Yeah, that’s it,” and he goes, “and then they’ve got this little spiky piano,” and then he plays, and there’s this very trebly little “dink, dink, dink” piano playing along with it. Then he goes, “And then there’s this harmonium,” and it turned out I’d forgotten, but we’d put all these layers into this piano that eventually sounds like one very groovy piano, so much so that I believed it myself. Because of the rerelease of Sgt. Pepper. I was inspired by how experimental we were and the inspiration that we’d had for Sgt. Pepper, and I thought, “Yeah, that’s a kind of good way to go, is to just not make the same old record.” Just trying to think outside the box and think, you know, what can we do now that’s crazy? It keeps it really interesting. You go in each day, and instead of thinking, “Oh, I’ve gotta do this song, I hope I do it good,” there’ll be a bit of that, but mainly it’ll be, “Well, if I don’t do it good, we’ll mess around.” We’ll get something that excites us. We’ll put a crazy sound on it and I’ll go, “Oh, yeah, I can sing to that,” and it’s often that. We did a lot of that in the Beatles. John was particularly fond of putting an echo when he was doing a vocal, so he would do what we called a bog echo. In Liverpool, “bog” means the toilet. You know, “I’m going to the bog,” and the toilet traditionally has got a good acoustic, so we would call this little delay on the vocal sound the bog echo. It just gives you a little bit different feeling than when you’re just hearing you’re own voice, plain and straightforward. It’s like you’re Elvis. This is the thing. What happens over time, things become legendary, so you’ll get John was the dark one, Paul was the cute one, and that’s not true, because we each had a bit of that or the other. George could be very much the one who’d bring that. When I’m talking about it, I always use that example of the song “Getting Better.” I go, “It’s getting better all the time,” and John goes, “Couldn’t get much worse,” so you know, that’s a good example of how we would do that. Often it could be George who’d do it just as much as John would, and I think I would sometimes take John’s songs and darken them. I mean, “Come Together” was a very jolly little song when John brought it in, and it was like, “No, we’re not gonna do that.” We had those kind of influences on each other, but the story sticks that John was the dark one, I was the light one, George was the mystic one, you know. To some degree that’s true, but we each had aspects of all those kind of forces, and Ringo too. He would come in, sort of put some drumming on it that, we’d be like, “Whoa.” I had the song “Get Back,” and I was just going (singing) and he comes up with (singing), and that drum beat makes that record. We were all four corners of a square, the Beatles. It was a very democratic group, so we all brought ideas in. Maybe John and I wrote most of the songs, but George wrote some of the best songs. :ike, “Something,” some of those songs he wrote. Fantastic. Because it was towards the end of the Beatles, all the forces that were later gonna break the Beatles up … which is mainly business, to tell you the truth … there was a lot of arguing about business, and we didn’t like that. We’d always traditionally just left that to someone else, but it got a bit dangerous to do that, and that someone else … who was a different someone else, actually … was about to nick it all, so that got …It was a guy called Allen Klein, yeah. It got dangerous. There was an idea that he was maybe going to take over, and take over all the money and all the stuff that we’d ever done, and that made it a difficult period. The great thing was when we got in the studio, it all changed, ‘cuz we were just these four guys again and it wasn’t to do with business. It was now to do with business, and so sometimes we did record separately. I would do “Blackbird,” but only because it’s a solo song. I did “Yesterday,” and I said to them, “Okay, guys, what are you gonna do on this,” and they all said, “Well, we can’t. It’s a solo song, you know.” It wasn’t ‘cuz we were arguing. Some of the great songs like, “She’s So Heavy,” John’s, I mean, we all got right in there. There was no … we were at peace when we were playing music in the studio. It was always a thrill, from the word go when the Beatles were formed to the word stop. We always got in the studio, and even if we were arguing, that kind of got superseded by the music. We argued like families argue. In the early days it was always John and George arguing about who would have his amp the loudest. They’d agree, “Okay, look, now let’s put it at seven,” okay, and they put it at seven, and then we’d be playing and you’d just see George kind of back towards his amp and go, “Nine?” Then John’d notice, so he’d quietly sneak towards his amp, ” Ten.” Then now we’ve got, “Hey, what are you doing?” That might cause a bit of an argument, but other than that, when we played music, it came good.